Currently we have 15% off on all Global Passes and to certain destinations for the One Country Passes for bookings made between 6 July 2018 and 16 July 2018. Please note the discount will be applied before you pay. Now, all you need to decide is where to go, and we know just the route! 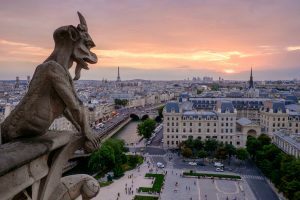 This route is for the all of you who like exploring different cultures and experiencing all Europe has to offer, but doing it on a budget (which we totally get). As there are a mix of beach and city destinations this is the perfect route for a group of BFFs who like both. From the beaches and sun-kissed skin in Spain, the breath-taking sites in France, famous chocolate in Belgium, to the history and chill vibes in The Netherlands. 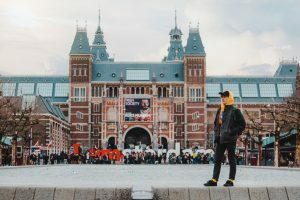 Spend time in each location soaking in the different cultures and capturing pictures that will make your Instagram account the most talked about thing since, well, Instagram! However, the first thing you need is your Global Pass, and guess what?! We have a SALE on now for that exact pass! Check out all the discounted prices here, and don’t forget to get your pass insured (because we all get a bit carried away while on holidays, which inevitably results in lost items)! If you just need to catch the train a few times during your European adventure then the Flexi Pass is for you! Travel as much as you want on any chosen travel days, with a given number of days allocated for the duration of your pass. 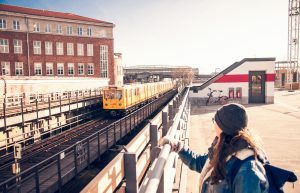 If you’re under 25 the 7 day, 1-month option for €216.73 will cover every train you’ll need on this awesomely cheap route! The first stop in your 7 – part Europe adventure is Lisbon! This is a must see. Known as the European San-Francisco (or so they claim). 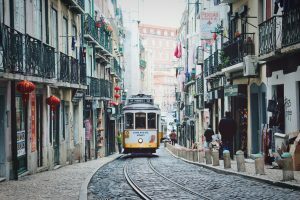 The city has both the lively nightlife of Bairro Alto and interesting historic monuments like The Sé de Lisboa Cathedral. When you’re finished exploring the city make sure you go and check out the relaxing beaches just a short distance on public transport. We would suggest spending 3 days exploring this famous city and all it has to offer. It is the perfect mix of a city break and sandy beaches. Accommodation – A range of hostels are available starting at €12 a night. Food – A light meal in a café or shopping centre €4-€5. Sightseeing – The entrance fee to Lisbon castle €8.50, Jeronimos Monastery €10 and the Torre de Belem €6. Your second stop is Madrid. To travel by Interrail from Lisbon to Madrid, make use of the direct “Lusitania” night train. It is the most comfortable way to travel. The journey time is about 10 hours so plenty of time to rest up! We found this was the best way to recharge! Madrid is known as the cultural hub of Spain. So it’s a must see on this 7-part journey. Enjoy the various museums such as the Museo del Prado, Centro de Arte Reina Sofía and Museo Thyssen-Bornemisza. Worried we didn’t mention any alcohol yet? Don’t worry! Madrid also offers an exciting nightlife with an abundance of bars, restaurants and nightclubs. Accommodation – A range of hostels are available starting at €18 a night. Drinks – Glass of wine €1.74, Pint €2.50. Your next stop is Barcelona. Get the train from Madrid Puerta de Atocha to Barcelona Sants. The travel time is 3 hours and extremely convenient. A seat reservation is also required. 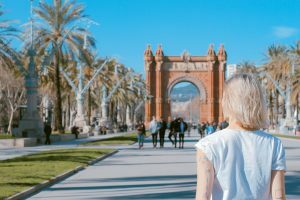 Barcelona is the home of many sun-drenched beaches to either relax and get a tan (or burn), have a go at kayaking or test your balance with stand-up paddle boarding! Visit the Olympic Port of Barcelona and Camp Nou, the home of Barcelona FC, try to catch a game there. The atmosphere is incredible! Accommodation – A range of hostels are available starting at €22. Food – Breakfast: €3. Lunch: €5. Dinner: €10. Your next destination is Lyon. Direct high-speed train services (TGV and AVE trains) are available but require quite high reservation fees. 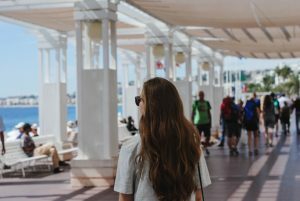 Travelling on a budget? We suggest using regional trains as these are free with our interrail pass. They might take a few hours longer but will save you a lot of money and give you time to revive your hungover self on the train. The route is Barcelona – San Sebastián – Lyon. Once you arrive in Lyon you can immerse yourself in all it has to offer. From marvellous museums, to amazing architecture to a bustling nightlife, we promise you won’t be bored in the city that has everything! Accommodation – A range of hostels are available starting at €20 a night for a private room. Drinks – Bottle of wine €6, Pint €2.39. Food – Combo meal in fast food restaurant €8. Next get the train from Lyon Part-Dieu – Gare de Lyon in Paris. This takes about 2 hours. The key to travelling to France on a budget is to avoid peak times and make your reservations to secure them cheaper. Paris is known for its famous monuments including The Eiffel Tower, Arc de Triomphe and The Louvre Museum and its incredible food. We know Paris can also be expensive, so we would suggest just walking on foot around Paris as one of the main draws are the pretty buildings and it gives you a chance to update your Insta with some quality influencer style pics! The Palace of Versailles is a short journey outside Paris but well worth a visit. If it’s good enough for Kim, it’s good enough for us! Accommodation – A range of hostels are available starting at €20 a night for a private room and free breakfast. Drinks – Bottle of wine €7.50, Pint €1.93. Food –Meal, Inexpensive Restaurant €7.00. To travel from France to Belgium avoid the Thalys route as there is high registration fees. Instead take the TGV train from Paris to Lille and then from there cross the border into Belgium. This takes about 3 hours. 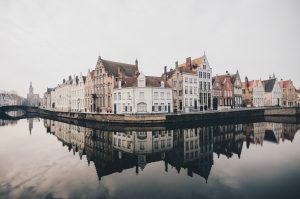 Bruges is a picturesque medieval city perfect for capturing those stunning Instagram’s and raking in the likes. Visit the Belfry and climb the 366 steps (if you can) to witness panoramic views of the city. Make sure you eat lots and lots of Belgium chocolate and stock up before you leave for the rest of your journey! Accommodation – A range of hostels are available starting at 15 a night for a private room, including breakfast. Drinks – Bottle of wine €6, Pint €3.00. Food – Budget dinner €14. Last but certainly not least is one of our favourite cities and could be yours too, Amsterdam. When travelling from Belgium to Amsterdam, again avoid the Thalys trains and the expensive reservation fees. You can travel with hourly IC Brussels trains these are slower but much cheaper which is music to our ears. There is so much to experience in Amsterdam. From the historic Anne Frank Museum (plus many more incredible museums), The Heineken Experience and the A’DAM Lookout. Getting accommodation outside of the city centre will make this city even cheaper! They have a good public transport system that will get you into the centre in a few minutes. however, if you do wish to stay in the city, hostels are definitely your best bet, and there are loads! Accommodation – A range of hostels are available starting at €22 a night. Drinks – Bottle of wine €6, Pint €3.50. Food – Breakfast €5, lunch €5, Dinner €5. To find out more about this awesome getaway, including more information on planning your Interrail trip including route ideas, maps, pricing and more visit our website – www.interrail.ie.